Spring and leather are 2 words that you don't really hear together too often but they can definitely be a match made in Heaven. I personally believe that leather can be chic in any season and these 38" inseam High Rise Leather Skinnies from Amalli Talli prove that. They set this structured spring look off. I simply love them. I paired them with a military inspired vest from ASOS Tall and these killer babies from Smash Shoes. I mean the lace-up fierceness is everything. Slay. Now the foundation is great but the accessories give this look a metallic exclamation point and the lines of both the bracelet and belt compliment each other without being too matchy-matchy. I hope you enjoy the look as much as I enjoy wearing it! How do you rock leather is spring weather? Winter finally set in on the west coast...well...our version of it anyway. When it started to get nippy out, I went in my closet to create layers which led to some major mixing of tall staples and off-the-rack items. I began where I always do; a tall foundation. I used 2 pieces that are long and slimming. They cover and create the perfect palate for layers. I then added a long, sleeveless sweater with a high collar to class up the joint and polished the look off with the marbled faux fur vest. With the foundation being appropriate in length, the layers can easily be copped right off the shelf. Don't believe me? Wear your tall basics to a store and try on a bunch of options. I guarantee you that you walk out with a new perspective of what will work for you in-store. Well...that's all I got. Coming off of a 16 hour work day leaves little brain power. Yes, it says 16 hours. Don't ask. See you soon beautiful...slay the day! Fall is right in front of us. It's time to get that pair of boots that are comfy and stylish. I found the perfect pair to boot upyour fall style. The Tess by Barefoot Tess 'Leather Slouch II" Boot is just what fall10 ordered. 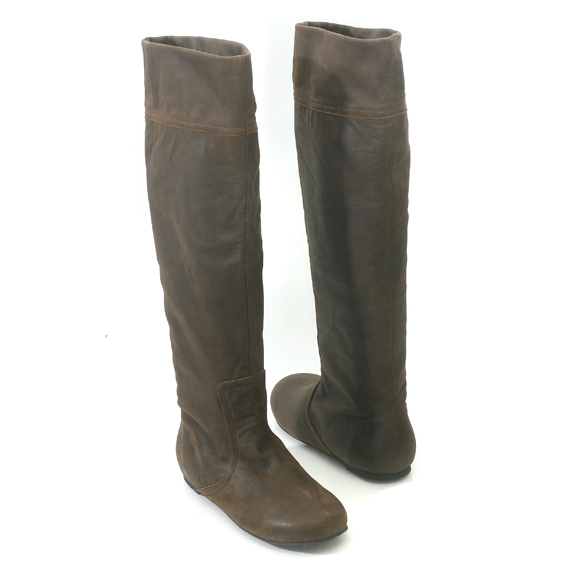 You can wear them slouchy or straight, in a beautiful brown or black leather and come in sizes 11 to 14. Don't miss out on your pair. Click the pic now. TESS BY BAREFOOT TESS LEATHER 'SLOUCH II' BOOT at BarefootTess.com. $159. Sizes 11 to 14. Shown in brown. Also comes in black. Can be worn straight or slouchy. Get this haute Tall Leather Panel Jacket from Topshop.com. It's a fashion essential and will complete your tall, fall wardrobe. There is plenty of length in the arms and just the right length in the body. Click the pic to order. SORRY. THIS ITEM IS NO LONGER AVAILABLE. Click the image to visit www.topshop.com for more tall fashions.